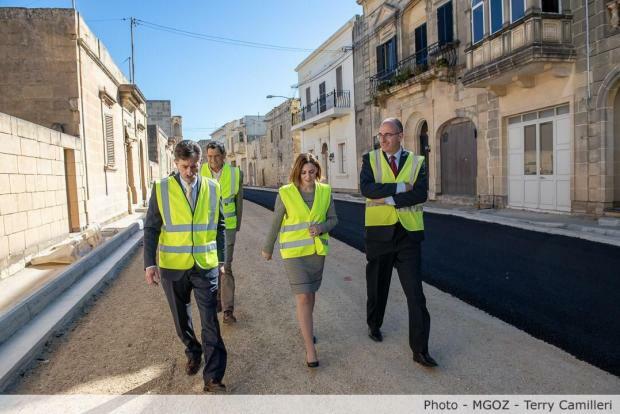 Surfacing works are being carried out on 50 streets in Gozo, and tenders have been awarded for others, Gozo minister Justyne Caruana said on Monday. She said the works are being carried out all over the island and involve both arterial and residential streets. The roads were selected after consultations with local councils. In most cases the works involve a total rebuilding of the streets. Speaking while inspecting works at Triq il-Ħamrija in Xewkija, the minister said tenders have been published for surfacing works at Triq l-Imgħallem and Triq ta’ Wara s-Sur in Victoria and Triq iż-Żewwieqa in Qala.